The first "hack" which allowed experimenters to use the Raspberry Pi's clock pin (GPIO 4) to transmit audio directly from the Raspberry Pi came from the Imperial College Robotics Society . Their "PiFM" module has since been modified and improved and is now capable of transmitting in 16 Bit Stereo on any frequency from about 1 MHz up to 250 MHz. It sounds too good to be true.... so I decided to try it out for myself! WARNING - DO NOT connect your Raspberry Pi's clock pin (GPIO 4) to any kind of antenna (even a short length of wire) when performing any of these tests! Almost immediately you should hear the Star Wars theme playing on your portable radio. You can stop playback by pressing "Ctrl+C" or you can let the music play right to the end of the ".wav" file. However.....PLEASE NOTE that in either case your Raspberry Pi will continue to transmit a carrier on the frequency you have chosen until it is rebooted or turned off, so please DO NOT leave your Raspberry Pi transmitting a carrier after you have finished experimenting! You can see the "fundamental" signal at 30 MHz, but there are multiple strong subharmonic and harmonic spikes all over the RF spectrum. I also noted that if I tuned my receiver to any multiple of 30 MHz (e.g. 60MHz, 90MHz, 120MHz etc) I could clearly hear the transmitted signal, sometimes very strongly. 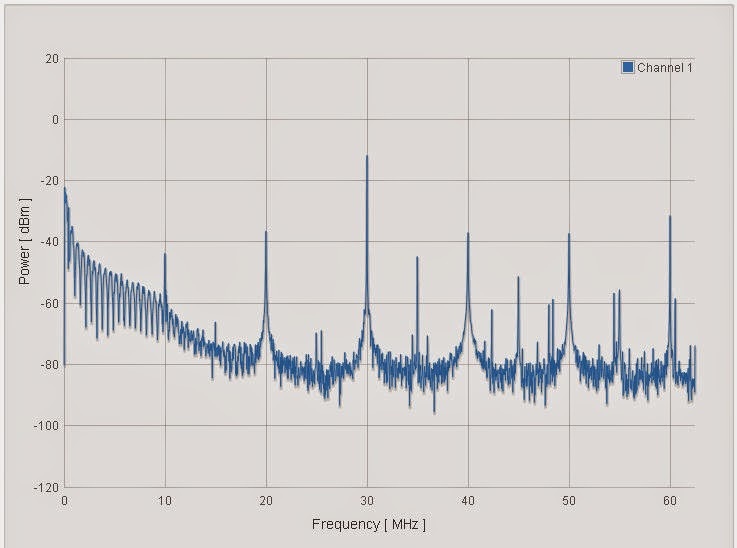 Therefore please DO NOT connect your Raspberry Pi's clock pin (GPIO 4) to any kind of antenna when performing any of these tests, because you will generate unwanted and potentially dangerous RF energy right across the electromagnetic spectrum. Whilst it is very easy to use the Raspberry Pi's clock pin (GPIO 4) to generate an RF signal, and even transmit audio, the usefulness of this hack is severely limited by the huge amount of harmonic and subharmonic distortion in the signal (because it is basically a square wave). I've read many articles which suggest the Raspberry Pi may be a used as a low power transmitter for the amateur radio bands simply by using a low pass filter on the output, but I'd say even this is insufficient (due to the subharmonic distortion in the generated signal). To make any practical use of any RF signal generated by the Raspberry Pi in this way would require very good band pass filtering. * produce a sweeping tone on FM 87.5 MHz. I was just curious what you mean by "potentially dangerous". Is that dangerous to the Pi itself, other electronic devices, human health, etc? I was going to build one of these and use it around the house on a regular basis but after reading your post I'm a little wary now. Dangerous for legal reasons. Harmonic splatter causes the radio waves to emit all over the electromagnetic bands in which case potentially interfering with police, air traffic, ems, schools, busses, etc. if u do interfere, the fcc will most likely be at ur door in like... less than an hour. Wow, I have been surfing the internet for the past few hours and I have not come across such an interesting site with great content and a unique design. I have gain a lot from posted article and I have increased my general knowledge and I am very grateful that I landed on this site and found this great content. Access our site for affordable but Professional Editing Service.